Yes it has been a few weeks since I last posted this and I apologize (mainly to my mom whose my most avid, yet sports clueless reader). I’m back on it though so I won’t waste time. onward! Cleveland Indians are scorching: Few teams can claim to be as hot as the Cleveland Indians right now. Since losing five in a row from April 14th-19th, the “Fighting Francona’s” dropped 19 runs on the Astros to kick-start a 20-8 blitz since April 20th. Carlos “baseball playing” Santana has emerged as one of the top catchers in baseball (.290, 7 HR, 16 RBI’s, .399 OBP), and as mentioned before Mark Reynolds has cut down on the strikeouts and continues to hit the ball a miracle mile. Zach McAllister and Justin Masterson have taken it upon themselves to lead a staff Ubaldo Jimenez seems incapable of leading. Masterson (7-2, 2.83 ERA) and McAllister (6-3, 2.65 ERA) have stepped up big time in Cleveland; and if the reclamation of Scott Kazmir can continue they could (as I wrote in the offseason) compete for a Wild Card spot in the American League. If not, as constituted the overall makeup of their pitching isn’t doing them any favors if that offense goes cold. Speaking of hot, Texas Rangers baseball anyone? : A team I was wrong about is proving me wrong in a big way. 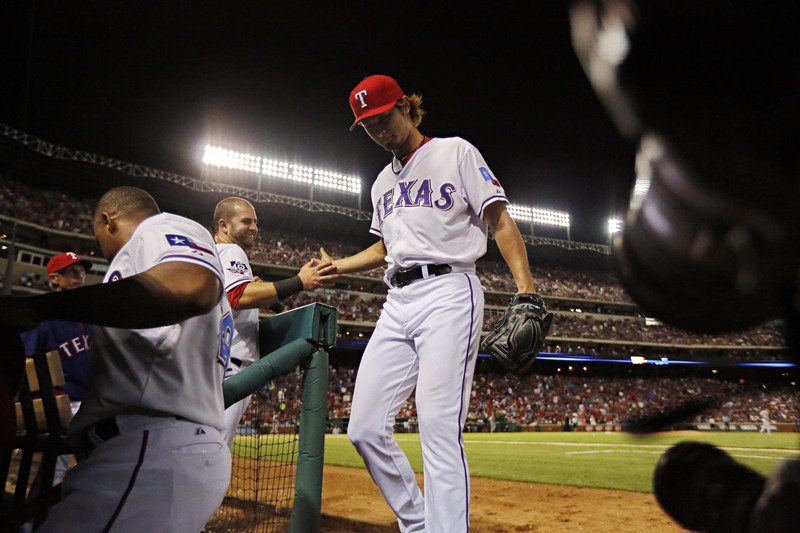 The Texas Rangers lost two aces (C.J. Wilson and Cliff Lee), an MVP (Josh Hamilton), and a slugging catcher (Mike Napoli) in subsequent winters. Yet here they are on May 20th, 2013 five and a half games ahead of the Oakland Athletics in the American League West. How are they doing it? As per usual its pitching. Yu Darvish might be the AL Cy Young to this point in 2013 (7-2, 2.84 ERA, 91 K’s), and Derek Holland (6-3, 3.30 ERA) and Alexi Ogando (4-2, 3.08 ERA) are supporting nicely. Consider Colby Lewis is scheduled to join the fun sooner the later and you have the makings of a staff that is set for a run. Smoke and mirrors in the Bronx: Somehow, without a lineup full of stars, the Yankees have navigated their way to first place in the highly competitive American League East. Who knew that all Vernon Wells (.288, 10 HR, 24 RBI’s, .343 OBP) needed to do was get out of Anaheim? Travis Hafner (8 HR, 24 RBI, .275 BA) seems to have also turned back the clock as well, producing at a rate he hasn’t since about 2007. Couple that with another MVP caliber performance from Robinson Cano (.290 BA, 13 HR, 32 RBI’s) and you have a lineup that, so far, has been able to stay afloat in the absence of Derek Jeter, Mark Teixeira, and the recently Curtis Granderson. How incredible is Mariano Rivera? In his final season he’s converted all 17 of his save opportunities and has done it with an ERA of just 1.47. if this is the final season from a 43-year old reliever, it is shaping up to be a special one. Rafael Soriano made news when he criticized franchise star Bryce Harper for misplaying a ball that went over his head and led to a triple and eventual loss for the Nationals. My only response: don’t let them hit it. While I understand his frustration, and can even agree that Harper played the ball terribly team sports 101 clearly states you don’t throw your teammates under the bus publicly (especially your franchise star). Poor judgement here for a team scuffling. The Minnesota Twins pitching is bordering on historically bad. After last nights loss to the Detroit Tigers they’ve now lost nine games in a row and 10 of their last 11. Adding insult to an already miserable situation, their team ERA is now 28th out of 30 major league teams, and they’ve given up an average of seven runs a game their last six. Joe Mauer and Justin Morneau are doing what you’d expect, but everything else to this point is going to make it a very long summer in the Minnesota for baseball. The Braves will have some major roster decisions to make in the few weeks. Their bullpen, once a surety, has been decimated by Tommy John surgeries to All-Star lefty Johnny Venters and (should have been an All-Star by now) Eric O’Flaherty. Jordan Walden has been a question mark as well with his injury issues, and there are concerns as to who is going to get the ball to Craig Kimbrel. They are currently carrying three catchers on their roster as six-time All-Star Brian McCann has returned and is hitting .282 with four home runs and 12 RBI’s. Evan Gattis has been the most incredible story of the early season, but the Braves might not be able to carry three catchers with depth issues in their bullpen. McCann is the superior talent to Gattis, Gattis is the most valuable piece the Braves have on their roster. Brandon Beachy is coming back from Tommy John surgery in late June and you could see a Braves team that is very active at the trade deadline (Paul Maholm out?). Can we please figure out some way to get the Houston Astros and Miami Marlins in a series? Can someone make that happen? The Astros (14-33 and Marlins (13-34) of course are the first teams mathematically eliminated from anything (okay, that isn’t entirely true but it feels like it). The Reid Ryan hire as president of the Astros was a solid move (the first in a while), but it will take some magic to get that ship right in Houston. It will take even longer in Miami, where fan venom between owner and fanbase has gotten so bad that attendance in year two at new Marlins Park already resembles Joe Robbie-Pro Player-Dan Marino’s Playground-Stadium they left just after 2011. To make matters worse, Jeffrey Loria has been accused of usurping his manager’s (Mike Redmond) authority on lineup matters. I gotta say, if Bud Selig wanted to concern himself with matters that are good for the game, he would probably take this big ol’ red flag and run with it. Why? This concerns field competition. Big deal. Read more about the Marlins woes in this great Grantland piece by Bryan Curtis. **And can I just say shame on Cleveland Indians fans? Chris Perez said a couple years ago (although to be fair, he’s apparently said a lot of things that haven’t gone over well) he was annoyed by fan attendance at the ballpark. Admittedly, you had a reason not to show up then. Now? Not much of an excuse seeing as your team is in first place, playing its best baseball since 2007, and legitimately have a chance at no less than a Wild Card spot. I get that a baseball season is 162 games long, but for the Miami Marlins to be beating you in attendance is pretty inexcusable. Oh, and before I get the “don’t hate on us” responses remember this: I picked your team to finish second and to do what they’re doing right now before the season started.